The conversation was challenging. In a Critical Studies conversation we had wandered to Michelle Rhee, the head of Washington DC's schools, TFA and Joel Klein/Mike Bloomberg graduate, Time Magazine's favorite educational leader. I said, as I have before, that I believe her policies are racist and colonialist. That she is a "reductionist" regarding minority children, wanting (as Teach for America and KIPP do) to give them only the basics, to refuse to offer them the kinds of education offered to middle class white kids. As I've said before, when I see this stuff in Scarsdale, NY, Greenwich, CT, River Forest, IL, etc, I'll accept that it's a good educational strategy. But Cleo Cherryholmes, an educator par excellence, as we say, challenged me with the opposite tack. Impoverished minority kids need to learn "to be white" as Rhee insists. They must learn how to speak the English, and behave in the way, that will get them hired by, as Cleo said, "Goldman Sachs." Cleo is a pragmatist, he wants actions which can prove the theory. "Wait," I said, "still colonialism, still the powdered wigs for Nigerians and Indians so they could become Brits." And, I added, "there's a counter-narrative, an anti-colonial narrative." 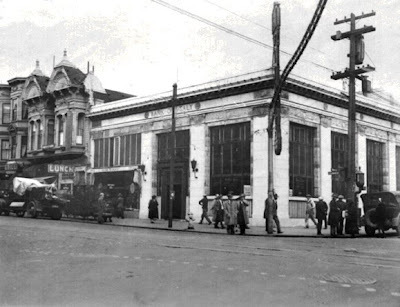 Bank of America (then Bank of Italy) was founded in San Francisco so that immigrant businesspeople did not have to learn perfect English or climb the Anglo power structure. I called this, "The Bank of America Narrative." I was going to say, "The Black Panther Narrative," but I'm working on getting better at this politics thing. The "Bank of America Narrative" is the way the Irish and Italian immigrants "became white" in America. Italian immigrants built their communities and their economic well-being by deliberately not "being white." Whether through various "mob" enterprises or through the Bank of America - founded as a place where those speaking Italian and functioning in "non-American" ways could still do business and succeed, Italians went their own route until they could join the American economy as equals. They even followed the lead of their Irish precursors in keeping their children away from the white, Protestant public schools - sending them instead to Catholic schools where priests and nuns spoke the way the community did. The immigrant Irish refused to send their children to "white" public schools, to learn "white" ways of speaking, acting, and praying. They organized their communities and took power on their own terms. 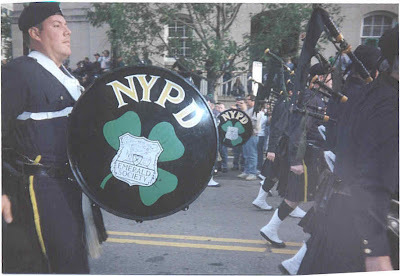 As the Irish had refused to become Protestant or give up their accents (see any NYPD officer circa 1945, 100 years after the great migration began), the Italians did the same. Unlike the Irish the Italians were more business oriented, while the Irish had seized control of big city politics and government jobs, Italians built a huge array of commercial enterprises, but the effect was the same. They were recognized as "white" when they could buy their way into the American society. They didn't want to be "hired by Goldman Sachs," rather they built Bank of America and became police commissioners and mayors across the nation. This is the opposite of the African-American experience in the United States. African-Americans have always sent their children to white controlled schools. Integration just made that more so. A mass of Black children dropped into completely unchanging, non-adaptive, schools designed for and around white Protestant children - judged by white teachers and administrators, and almost always judged as inferior because they were not "white enough." This is Gramsci's "Cultural Hegemony" at work. African-Americans can only succeed in education by becoming "as white" as possible. Of course this is also British Imperialism, Indians, Irish, Nigerians, South Africans, Malaysians trying desperately to be "white enough" for full British citizenship, but always, obviously, falling short in this impossible task. It is this very form of integration that the Irish and Italian immigrants to America refused to engage in. And, at least in one place, the Historically Black Colleges and Universities, true, culturally connected African-American-controlled education has demonstrated its success as well. Yet the prevailing wisdom today is that African-American and other troubled minorities can only climb the American success ladder by being second-class whites: by letting whites set the bar in all things - in speech, in literature, in governance-style, in social mores. Michelle Rhee believes it. Joel Klein and Mike Bloomberg believe it. Paul Vallas believes it. Arne Duncan believes it. Unfortunately, in my opinion, there are black leaders who believe it as well. But, my Gramscian thought, is that you can only believe this if you believe that Black culture is inherently and historically inferior. And I don't believe that. "The counter-narrative matters," I told Cleo, who smiled, as he does when he thinks we have argued well, because so many today insist there is only one way for minority groups to succeed. It is important because African-Americans, even African-American leaders, have forgotten the message of the Black Panthers, who insisted on self-help and self-defense, pride, belief in possibility, community organizing, and community intradependence. This counter-narrative suggests that we need not force minority students to learn to march and chant (KIPP), we need not "just" give them white role models to copy (Teach for America), we need not deny them the creative education all children deserve (Michelle Rhee, Joel Klein, Paul Vallas, Arne Duncan). Rather, we can help them take control of their communities and their lives within the context of their own culture. Which is what I had to say about why I call Michelle Rhee a racist. And then we went back to discussing Pedagogical Pleasures, which was far more entertaining. I had a great graduate class on curriculum. One quote from that class really stuck with me: "Children are never inherently 'At-Risk'. They are placed 'at-risk' by adults who force them into situations that fail to meet their needs". Rhee et al lay the blame squarely upon teachers for under-performing when the blame really belongs to a system that really puts students "at-risk". It is a system that tries to bend the students to its own conventions rather than adapting to meet the individual needs of the students. It is a system that Rhee and friends perpetuate. Paul Vallas was our Superintendent here in Philly before our current one, Arlene Ackerman. They are both close followers and colleagues of Rhee. Ackerman has completely bought into The Race to the Top, calling for more 'accountability' for teachers (aka asking them to do more with less), implementing mandates for scripted programs in 80 of our 275 schools entitled "Empowerment Schools" because they are close to failing, and implementing not one, but two standardized tests within the first 6 weeks of school. Our teachers don't have time to breathe, so forget fostering creativity. How does creativity fit on a data wall? How can you measure a child's self esteem or personal growth if it's not measurable by a constructed response aligned to Webb's Depth of Knowledge and the PSSA writing rubric? While these assessments have a place in the classroom, we are cheating our students (my school is 99% African-American) of what you describe as a middle class education. As a side note, I grew up in Westchester County, NY--right in between Scarsdale and Greenwich--so the difference glares me in the face every day. On another side note, I share a building with the newest KIPP school in Philadelphia. Their staff have been nothing but stuck up and rude to us so far this year, with a 'better than thou' attitude. Sorry for the rant. Thank you for sharing your thoughts on a topic so close to many of our hearts and minds. It's more than "doing a job" Michelle. Without the creativity, where's the purpose (for both students and adults)? Why even bother? Thanks to both of you for brilliant comments. Having attended school myself in between the poverty of The Bronx and the wealth of upper Westchester, I watched this contrast daily. Now, visiting schools, I continue to see it every day. "The Matthew Effect" - the rich get richer and the poor get poorer and our system is designed to ensure that those behind never catch up. Mike, thanks for contrasting Postman with Rhee. I saw first hand what Postman's system could do with urban kids. And I've seen what Rhee's plan accomplishes. And I know which one is colonialist terror and which one is a path to possibility. Adding the Reverend Jeremiah Wright into the mix. You can skip the first ten minutes. He may not be entirely correct, but he's worth a listen. "Different does not mean deficit." I used to, unknowingly, buy into Rhee's viewpoint. Everyone should learn the same. Speak the same language. Translate: the white way. Eubonics be damned. Very dear friend of mine teaches Hillbilly Eubonics whenever he has the opportunity. And, after I heard him, I thought, what about Jewish Eubonics? We all have our different (but not deficient) ways of being and learning. I have two special ed kids. I have no room to cast stones or to cast aspersions. We need to see to it that all can learn regardless of how different we are. Creativity is not measurable. Teaching to and testing for intelligence is lazy thinking. If we focus on intelligence tests, we are not looking at the big picture. We need to see the person. Take a more holistic approach to education. We need to stop living in the industrialized age and finally shift to the post-industrialized age in terms of how we educte children. We are not in need of producing cogs for a particular machine. We need to recognize and celebrate individual members of society and help all live up to their potentials. Insisting that children lockstep is to squash spirits. I speak from personal experience. Was I deficient or just different? Are my daughters deficient or just different? We need to stop having educators who think like bureaucrats and who approach education as loving, caring and compassionate, and, yes, creative human beings who are capable of bringing this out in their students. We don't just need to see a shift in technology, ie, giving up paper, but we need to treat all students regardless of race or gender or orientation as special. Yes, it's a vastly overused term, but I cannot think of a better one. Aren't we all differently abled or differently brained? It's about time that all of these are celebrated and not stifled. Rhee might not be a racist, but she certainly is shortsighted. We need to shift this paradigm of placing test results above all else or we are going to lose a lot of children. They will continue as they have for many years now to tune out and drop out. It's hard to articulate why I don't like Rhee, but you're sure doing a good job of saying it for me, Ira. Ira, I check your blog often but rarely post. This time, I couldn't resist. This is the same position you've held for some time (TFA, KIPP, Ree as (post)colonial imposers of white culture), and you've been offered the same support here as you have in the past. It concerns me to think about the effect of informing our curriculum and teaching by the underlying idea that all cultures' values are treated as equally important and significant. They are not. In this country, white men and women belong to what Lisa Delpit would refer to as the "culture of power". Delpit's response (which I think is the right one) is to 1) affirm that all student's come from cultures whose values are and should be important but to also 2) acknowledge that there are codes or rules for participating in the culture of power and that by teaching these rules explicitly, we make this power easier to acquire. Key to this is reminding students that the codes and rules for the culture of power are completely arbitrary, that there is nothing that makes these inherently "good". Delpit has much more to say on this matter, and while my passing reference to her may lead some to believe that she has accepted the culture of power as a fixed reality, she has not. You can find her canonical essay "Silence Dialogue: Power and Pedagogy in Education Other People's Children" by googling that title and adding ".pdf". Deplit says it best: "To act as if power does not exist is to ensure that power status quo remains the same. To imply to children or adults that it doesn't matter how you talk or how you write is to ensure their ultimate failure." I think ultimately what underlies our disagreement here is a difference in what we believe to be the purpose of education. I won't attempt to surmise what you believe the purpose of education (or more specifically, schools) to be (although I would love to hear your thoughts - next post?). For me, the purpose of schools is to promote intellectual and moral development so that students become self-reliant and empathetic members of society (I'm fully aware of the tension between these aims, but I really believe them to complimentary and not competing). To this end, and specifically speaking to the self-reliance bit, I think TFA, KIPP, and Rhee are successful than you credit them for. I'm not opposing Lisa Delpit as asking to expand the idea. Can we teach children the acknowledgment of power without indoctrinating them in the belief that power structures are unchangeable? In the Twitter debate which has accompanied this post I've pointed out that, as an example, the Irish (in Ireland) both revived Gaelic and transformed English, becoming "better" at English than the English - but they only did that by not accepting the structural limits of Anglo language. And in India Ghandi firmly understood the need for cultural transformation. His extreme dress was part of that. His refusal to fight "the British way" was another. I think it is a powerful thing that in the 1840s the poorest free people in America created their own school system from scratch, rather than hand their kids over to the white Protestant public school system. These were refugees literally close to starving to death, but they refused to take the "simple" steps of integrating with a culture which treated them horribly. Had they converted to Anglicanism, and begun speaking "like Americans" - they perhaps would have blended in as quickly and easily as the "Scotch-Irish" had 75 years before, but they chose not to do that. So what do I think education is - and isn't? Here's a start http://human.edublogs.org/2009/11/07/rolling-up-the-odd-sleeves/ part of a series written with two Aussie pals. I think education should be about liberation. About liberating students from the limitations of their own experience, so possibilities arise before them. But, yes, I may need a post on this. By the way - by their measurement systems - NAEP scores, Rhee, Klein, Duncan have accomplished nothing in DC, NY, Chicago. Making local tests easier each year in order to fake progress is ridiculous by any standard. I love your work. Your writing is very passionate and full of power. I live in a middle class community and run the local Catholic High School. Many of my friends argue the local public schools should just revert to vocational tech programs because they are practical. When I point out that statements like that sound rather racist I'm stared at with wide eyes as if I'm a crazy person. When I ask, "What is it about being from a certain zip code that should relegate your educational choices to vocational tech at the expense of art music and everything else?" - the stares turn uglier. It's often fun to listen to rich white people come up with the educational answers for everyone else. By any chance do you remember the book where that quote is located? I really could use it for a book I am working, based on that specific concept. I will address under-representation of minority students in Gifted programs and overrepresentation in Special Education. I will focus specifically on one metro Atlanta district and minority students are almost 3 times as likely to be placed in SPED as they are in Gifted. BTW: When will the t-shirts be ready? I would like a Medium!